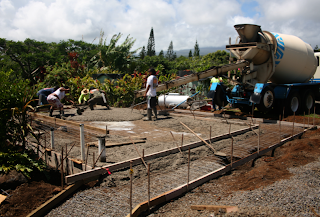 This past thursday we had a break from the rain just in time to allow for the new cement slab to be poured. It's the first major step in converting our old tractor/car shed into an office space. 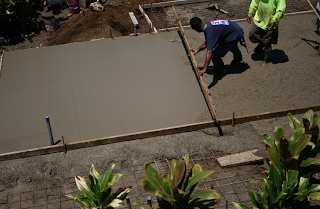 It will also house our electrical and water utilities. I like this pic Conn shot from the roof of the house. You get to see the whole layout of the form. 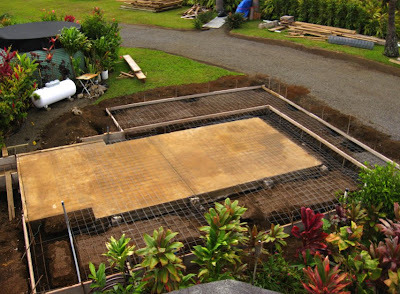 The existing slab is the remains of the foundation of the shed that we had to take down to make way for the new slab. 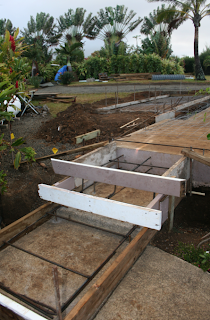 The stairs are all formed and reinforced ready for the cement to be poured in. Here you get to see the masonry crew transporting the cement to the back of the slab because the truck's chute wouldn't reach that far. 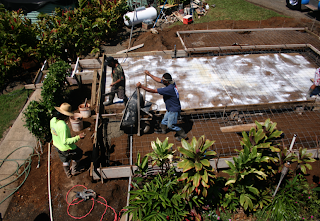 The white stuff is a glue to help the new cement adhere to the old slab. From the front you can see the whole masonry crew (sister too!) shoveling and getting the cement to fill all the nooks and crannies of the form. Smoothing it out to make it nice and level. 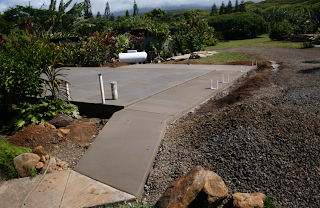 The gray conduit coming up from the slab is for the electrical connections to the inverter. And voila! We blinked and they were done! The metal braces you see in the front are for the 6x6 posts that will hold up the stairs and balcony for entry into the office. 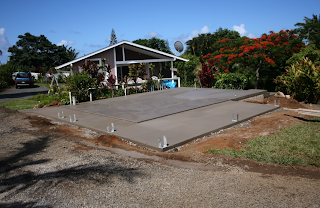 Here's a view of the finished slab from the front of the house. 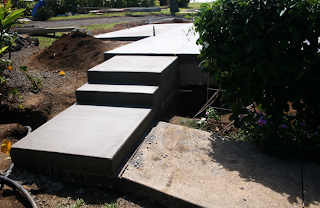 You can see where we tied in the new slab into our existing front walkway. Love this shot of the finished stairs. Framing is set to start monday so stayed tuned for pictures of that sometime toward the end of the week. really and truly - this is too damned exciting. almost like building a new house! it's going to be so much fun to work in there...are you crazy with anticipation? Wow! Your new build is really coming along!